Circe, 1977. Courtesy Estate of Nanette Bearden and DC Moore Gallery, New York. "Romare Bearden: A Black Odyssey," a dazzling exhibition of collages and other works by one of the most powerful and original artists of the 20th century, opens Dec. 14 at the Michael C. Carlos Museum. In 1977, Romare Bearden (1911-1988) created a series of collages and watercolors based on Homer’s epic poem, "The Odyssey". 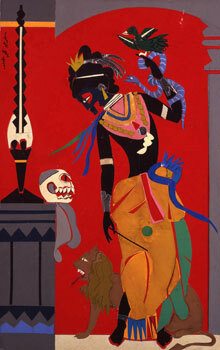 Rich in symbolism and allegorical content, Bearden’s Odyssey series created an artistic bridge between classical mythology and African American culture. The works conveyed a sense of timelessness and the universality of the human condition, but their brilliance was displayed for only two months in New York City before being scattered to private collections and public art museums. A new exhibition from the Smithsonian Institution Traveling Exhibition Service represents the first full-scale presentation of these works outside of New York City. Curated by the esteemed scholar Robert G. O’Meally, this exhibition reunites the 1977 series in all its glory. It also expands the scope of the original exhibition with splendid watercolors and other relevant works from the artist’s œuvre. Included is a rare grouping of mid-1940s Bearden drawings based on the other Homer epic, "The Iliad." This exhibition simultaneously expands our view of the Bearden canon and his influence as an artist, while reinforcing Homer’s continuing relevance as a poet. It also proclaims that to be black in America—and indeed to be American in our new global village—is to participate in a culture that knows no boundaries. In the unique language of visual art, "Romare Bearden: A Black Odyssey" is a startling retelling of Homer’s ancient story of Odysseus, the “man of many ways” who faces temptations and battles adversaries to make his way back home to Ithaca. While this mighty sea-tale of a brilliant but dislocated hero’s journey home originates with Homer—Bearden makes it undeniably his own. Throughout his career, the search for home was the artist’s most pervasive theme. For decades, he created country- and city-scapes of family love—typically secure but sometimes uneasy images of life at home and travelers making their way back. In our contemporary world, this Homeric/Beardenian theme of traveling home is part of our own identity. Persistent change, continual violence and disruptions of many kinds have rendered us a global citizenry of wandering exiles seeking a place to call home -- or a feeling of home -- in a strange and shifting world. To stress the true universality of Homer’s epic, and to make it more relevant to the lives of blacks as well as to his own experience as a modern black artist, Bearden makes all of his Homeric figures black: gods, mortals, heroes and villains. This choice asserts the central meaning of the story: a father and husband trying to get home, a son missing his father, a hero tempted to give up his quest, a wife’s tested patience. These themes, Bearden assures us, apply to black people as well as to anyone else. "Romare Bearden: A Black Odyssey" is organized by the Smithsonian Institution Traveling Exhibition Service in cooperation with the Romare Bearden Foundation and Estate and DC Moore Gallery. The exhibition and its related educational resources are supported by a grant from the Stavros Niarchos Foundation. The exhibition, on view at the Carlos Museum through March 9, 2014, in Atlanta has been made possible through generous support from the Massey Charitable Trust, the Coca-Cola Company, and Anthony and Celeste Meier.